Today am here to review a lipstick from blue heaven. I bought makeup stuffs from blue heaven few months back and this lip stick is one among them. The lipstick that am talking about is blue heaven non transfer lip color. I have used it a lot and I’m here to sum up it’s pros and cons. I’m not an expert in reviewing makeup stuffs but I try to sum up details about this lipstick in this post. I have shared overnight hair mask for hair growth in my previous post. If you haven’t check that, you can read it here. 205 INR for 2.8ml. You can buy this here . cyclopentasiloxane, trimethylsiloxyxilicate, polyethylene, silica, mica and approved colours. First, apply the lip colour on the upper lid and glide from one end of the lips to other. Then move towards the lower lip & glide from one end of the lips to other. Smooth out the corners of the lips well. 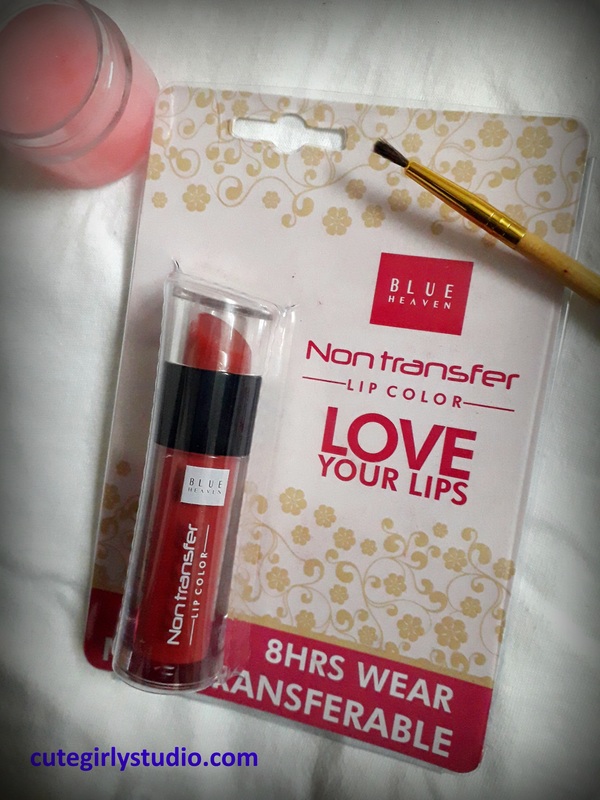 The Blue heaven non transfer lip colour comes in a plastic tube container with applicator. The lipstick tube comes in an outer cardboard that has all necessary information in it. The plastic tube is sturdy. The cap that has applicator with it closes the tube tightly and thus prevents drying of the product. If you own more than 1 lip colours from this range, then you can easily spot the required shade. Overall the packaging is good and travel friendly. The shade that I bought is punk maroon. The Blue heaven non transfer lip colour is liquid lipstick with matte finish. 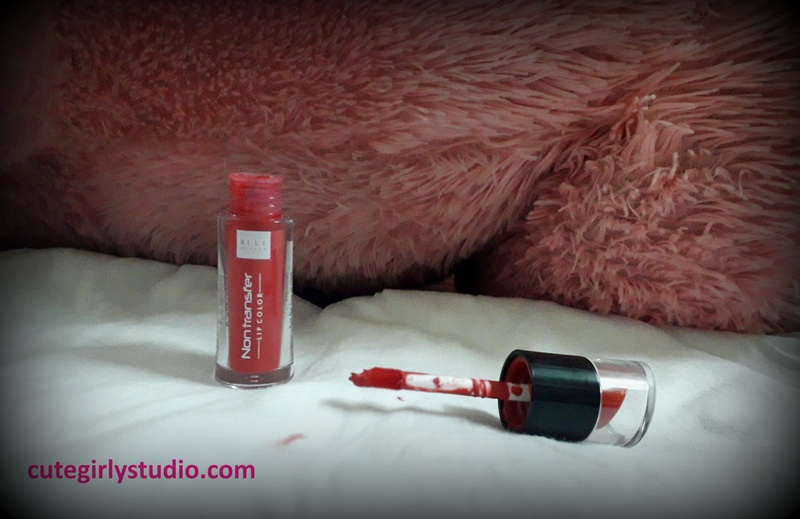 The lip colour is creamy in texture and it is not sticky like few other liquid lipsticks. 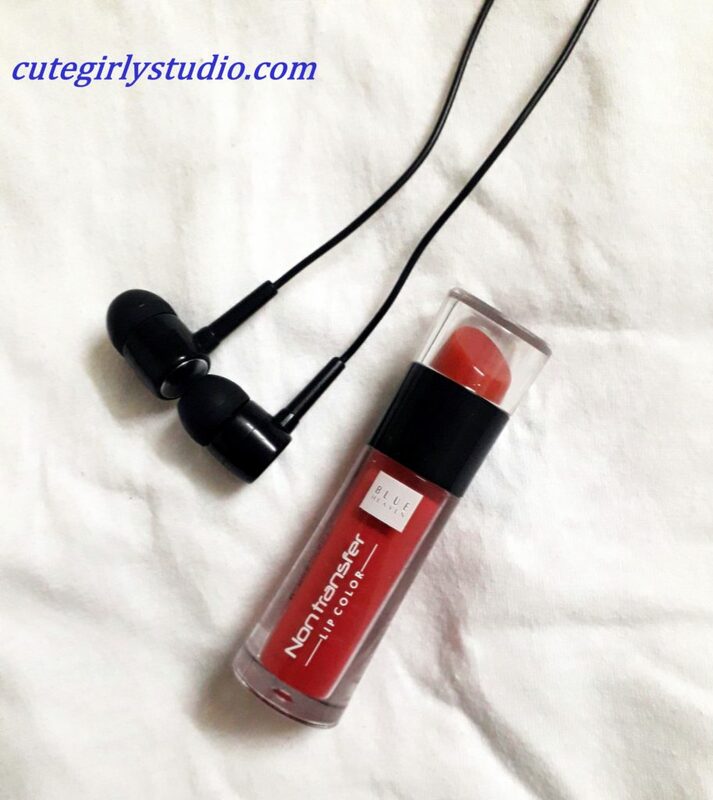 The applicator helps you to apply the lipstick perfectly. The applicator is small in size and thus gives us more control while applying the product. The lip colour spreads evenly without looking patchy and cakey. The lip colour is extremely pigmented and covers pigmented lip with 2 swipes itself. The Blue heaven non transfer lip color has strong artificial fragrance which I personally hate. It has strong mogra fragrance which resembles room freshener. The fragrance fades after application. The lip color stays on for a long time and it doesn’t need reapplication throughout the day. It survives meals and beverages. I applied this lip color and went out and I had my meals and drinks. The lip color was still there on my lips. So this is definitely steal for the price we pay. I don’t find any flaw in this product other than the strong fragrance. Compact and travel friendly packaging. This shade compliments all skin tones. Stays on your lips for long hours. Opaque finish with 1 swipe itself. The applicator gives good control while applying. Subscribe to my blog and follow me on Facebook | Instagram | Pinterest .